GoldenEye 007! They’re re-making it for Xbox 360 Live Arcade! No they’re not! Yes they are! It was canceled! It was never canceled! Well, here we go again folks. It would appear that the magazine “Xbox World 360″ has landed an “exclusive” for their next issue in which they’ll reveal an Xbox 360 title and have hands-on impressions. The issue gets released next Wednesday. Just look for a frenzy of rumors to kick up about the game being GoldenEye. Why? 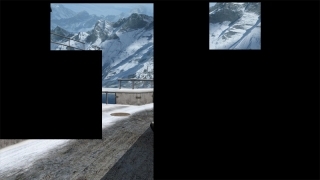 The magazine’s website has been releasing pieces of a screenshot to tease their readers and when you jigsaw them around, it’s clearly a screenshot of GoldenEye on the Dam level, but with prettier graphics. Or so we would think. The picture on the right is what one user has thus far put together.